One of my kindergarten team members, who has much more experience than me, had never done Pokey Pins, although the rest of the team members rave about it and do it on a regular basis. She has heard us talk about it plenty and I have shared my sets with her, just in case she changed her mind, but she was very concerned about the chance of an "accident", which is very understandable given her "clientele". Another K team member, who regularly does Pokey Pins with her students, invited her neighbors class over to give it a try with, wait for it, 40 students in 1 room! I was told that Mrs. B was very apprehensive, but enlisted some extra help to attempt this project for the first time. To make a long story short, I was told you could have heard a pin drop in the room (remember...40 5 and 6 year old students...this is HUGE!) and NONE of the pins were used as weaponry either! She was pleased with the results and, although I haven't asked, I think it is safe to say that she just might do more pokey pinning in the future (without even getting extra help!). Let me just say that I understand this fear simply because I know kindergarten aged children so well, but as long as you preface your first try with a big song and dance about responsibility, etc..your class will be good to go. If you are still sitting there saying, "What on earth is pokey pinning? ", you can go to this post to get more information. For those who are still unsure, I am providing a link to a freebie for you to give it a whirl. The students need to outline the penguin's lines and the Ps (advanced children get continue on to do the icebergs in the background and/or the outline of the page). You need to photocopy the penguin papers, staple them to the chosen colored paper, give each child a push pin and have them start creating pin holes on the black lines of the design. The key is to keep the holes very tight together, otherwise it won't look like anything. Here are samples from my full Winter Pokey Pin set that my boys 4 and 6 did. This set is from one project. I used thin double sided colored paper folded in half, stapled to the photocopy. I hung the photocopy up backwards and voila! 3 snowflakes! I can't wait to do it in my classroom and have them hanging all over our classroom windows for the sun to shine through. 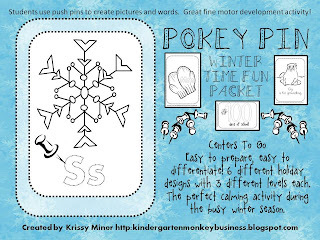 For those Pokey Pinning pros, I have just posted my Winter Pokey Pin Set at both of my shops, Teachers Pay Teachers and Teachers Notebook. There are enough designs to last you the entire winter! Your students will thank you for adding this activity to your classroom curriculum. It is especially great as we are all trying to complete asssessments in a quiet environment! Yikes!